Clinical decision support integrated in electronic order entry forms can safely and effectively reduce imaging orders for patients with low-back pain in the emergency department (ED), according to a study in press in Journal of the American College of Radiology. Low back pain (LBP) is one of the most common reasons for people in the U.S. and Canada to seek emergency medical care. Although its prevalence has not changed, the cost of LBP management has been steadily increasing each year. Much of this cost can be attributed to the increasingly common practice of routine medical imaging in the workup of LBP over the past several years. Currently, 42% of patients with LBP receive either an x-ray, CT, or MRI within one year of diagnosis, and of these, 80% receive imaging within one month of presentation. Indeed, a significant proportion of imaging studies ordered for patients presenting to the ED with LBP are unnecessary, with studies reporting inappropriate imaging rates between 15-30%. Clinical decision support (CDS) is a point-of-care strategy that has proven more successful in modifying physician behaviour than traditional educational methods. 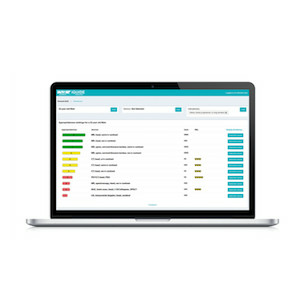 CDS employs a series of questions and checklists added to the existing computerised order entry form for medical imaging to help physicians make appropriate imaging decisions. This study aimed to determine if CDS is indeed a safe and effective strategy for reducing inappropriate imaging of LBP patients in an urban, academic hospital ED. Researchers conducted a prospective, single-centre study of lumbar imaging referrals made by 43 ED physicians at a major acute care centre. Each physician saw at least 10 LBP cases in both pre- and post-intervention periods. A point-of-care checklist of accepted red flags for LBP was designed by a working group of physicians and embedded in the computerised order entry form for lumbar imaging. After implementation of the red flag checklist, researchers observed a 22% relative decrease in the median rate of imaging of LBP patients in the ED. The percentage of patients without imaging who were later imaged at a hospital outpatient clinic within 30 days was 2.3% before intervention and 2.2% after. In addition, the proportion of patients discharged from the ED without imaging who returned to the ED within 30 days was 8.2% before intervention and 6.9% after. One minor thoracic spine compression fracture was missed, but management was not impacted. No serious diagnoses were missed. "In addition to a decrease in the overall imaging rate for LBP, individual physician image ordering rates also decreased. After CDS implementation, the mean imaging rate among individual physicians decreased from 24% to 20%, and the median imaging rate among individual physicians decreased from 23% to 20%," the authors note. However, physician variation in image ordering for LBP did not change significantly after intervention. In both the pre- and post-intervention periods, the interquartile range of physician image ordering rates was 13%, and there was nearly a 10-fold difference in imaging rates between the lowest and highest ordering physicians. Can interventions reduce image ordering for low back pain in the ED?